In 1995, the first ever installment of the Bibleman franchise came to be. 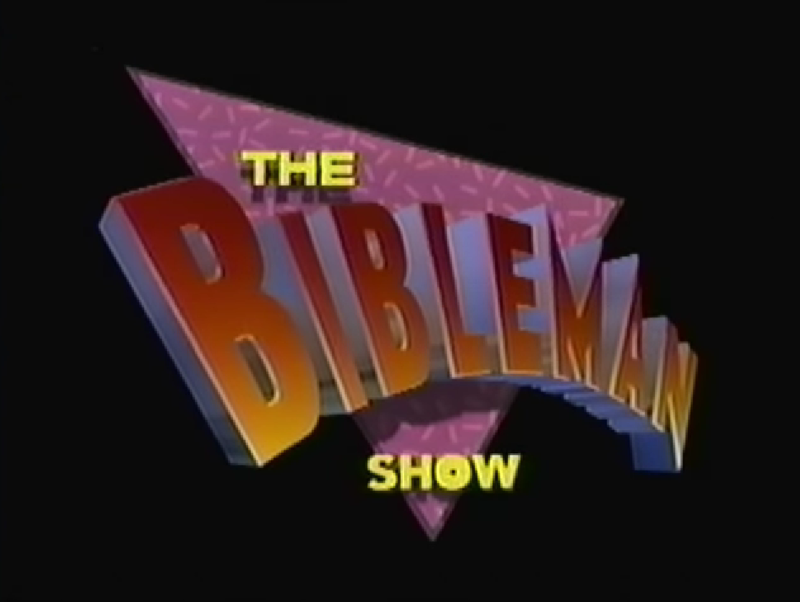 “Big Big Book” kicked off the short lived initial incarnation of the series, called “The Bibleman Show,” and launched an evangelical quasi-phenomenon. Willie Aames, who is best known for television shows like “Charles in Charge” and “Eight is Enough,” co-wrote, co-directed, and stars here as Bibleman, and is the person most publicly recognized as being associated with the show. 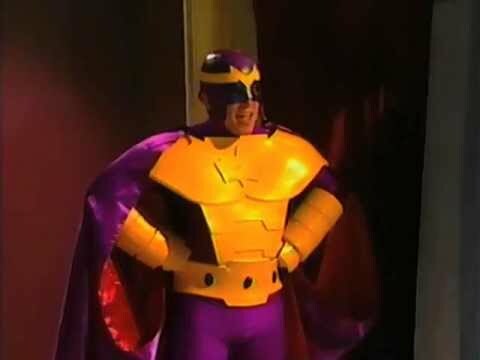 The initial Bibleman costume used in “The Bibleman Show” episodes is pretty laughable, and was clearly constructed on a minimal budget. Compared to the shiny, chrome/plastic uniform that would show up in later episodes, it is amazing to see how far the show and the character came over the course of its run. 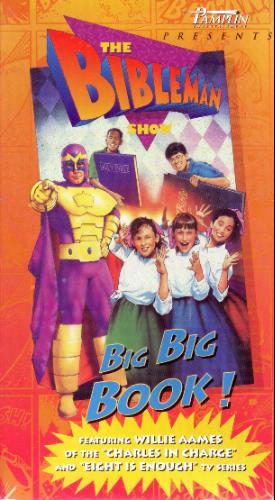 “Big Big Book” doesn’t feature any sidekicks for Bibleman, who I assume start showing up in the later series. The villain is a pretty generic evil scientist with green skin, named Dr. Decepto, which is certainly a pattern for Bibleman villains as the show goes on. He isn’t quite as elaborate or offensive as many of the later antagonist, but the performance is plenty hammy enough to be entertaining. He also has a great high-pitched evil laugh, which is always a plus. The story of “Big Big Book” follows a group of children who are working on a bible-themed musical for their church. The planning isn’t going well, and a number of the kids want to quit, in order to not be embarrassed by a sub-par result. Bibleman shows up at a rehearsal, and tells the kids a story about a previous exploit where he prayed his way out of a hairy situation with Dr. Decepto. The story gives them the confidence to go forward with the show, which theoretically goes off without a hitch. Except, of course, for the fact that it sounds awful, but no one seems to care all that much. They are just happy that they went through with it. The content of the musical is of course ridiculous, and takes a handful of potshots at science education and evolution. It is pretty much exactly what you would expect from a Bibleman musical, honestly. Some of the kids straight-up cannot sing, which makes parts of it nearly unwatchable. The whole thing is kind of like a worse version of “Kidz Bop” for fake Christian music, if you can imagine such a thing. The musical section also takes up a huge chunk of the episode, which unfortunately (?) doesn’t have a lot of Bibleman in it. The one fight sequence in “Big Big Book” is a blurry mess, and is almost as hard to watch as the musical. Bibleman notably doesn’t have the laser sword of the later episodes, instead using a traditional sword and shield. If there is anything positive to say about “Big Big Book,” it is that it actually has some charm to it compared to the later episodes of the seriess, which attempt to be comedic and self-aware. It is still completely awful and beyond cheesy, cut it is at least an honestly made mess. The theme song is also much different than what I am accustomed to hearing with the later episodes, which drift into a sort of pseudo-rock style. This initial theme song is pretty generic and forgettable, but certainly contributes to the heavy 1990s style of the episode. Speaking of which, the 1990s bleeds out of every pore of this video. The fashion, the hair, the music, the colors: all of it makes for an astounding flashback. The nostalgia factor of it all is actually pretty amusing, and might make the whole thing worth sitting through for some folks. As you would expect, “Big Big Book” features awful acting from all involved, and horrendous writing to boot. However, the added ‘benefit’ of the musical is what makes this episode stand out from the pack that I had previously seen. Lots of Bibleman episodes feature a song, but this episode being centered around a children’s church musical makes it so much worse than any of the music offered with other episodes. It is nearly unbearable. Brad Jones, better known as The Cinema Snob, took a look at this episode on his show “DVD-R Hell.” If you don’t want to stomach actually watching this, his overview hits the key points and highlights with his typical sardonic wit. This is the first of the initial run of “The Bibleman Show” episodes that I have sat through, and I’m mostly just hoping (praying?) that the rest of these early episodes don’t feature as much cringe-inducing singing.